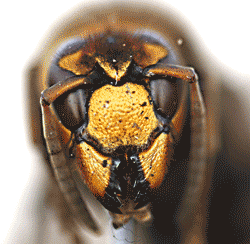 Hampshire Wasp Control Blog & latest news. Latest news from Hampshire Wasp Control. Over the last few weeks, we have had several calls from people wanting old wasp nests removed from their lofts. We have explained the reasons why there is no need to remove these old nests and have reference to the subject on several pages on our website. 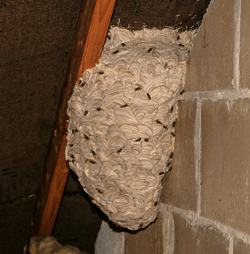 If you have an old nest in your loft, there is no need to have it removed, as wasps never reuse old nests. If you leave the old nest in its current position, it is taking up space that could be a potential nest site. 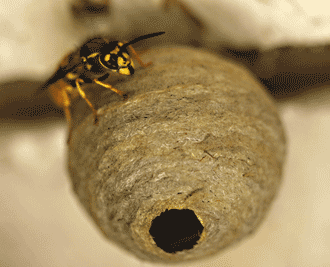 Wasps only use a nest for one season. Regards to my last blog post... forget that. 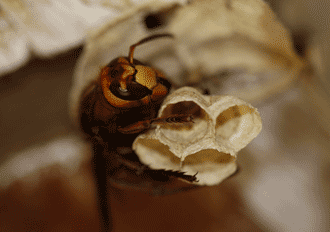 A queen hornet predated on that small starter wasp nest and it is no more. The surprising thing is she decided to build her nest in its place. A week ago I thought how can wasps build nests in this weather? So bad and cold I had to check the date just to make sure I had not made a mistake. It appears not to bother them too much. Found this beauty today in my shed. From what I can see inside this little starter nest, she is about 4 weeks away from hatching anything out. I will monitor for the time being and watch her progress. We seem to have gone from winter to summer in one day. It seems that everything else is trying its best to catch up. Birds are nesting furiously and insects are out en mass! One thing that is noticeable is the number of queen bumblebees this year, they are everywhere. A few queen wasps seem to be cruising about too. Welcome to our new blog. We thought we would add this section to our site so we can add updates regularly as to what we are up to and what is happening in the world of wasps. This winter has been slightly colder than average with some harsh periods. The forecast at the time of writing is for a further cold snap. This is actually beneficial to hibernating insects as it keeps them in hibernation for the right amount of time until the weather is warmer and there is a food supply available to them. On the surface, it looks like this could be a better than average year for wasps, but predicting nature is fraught with danger and you can never say for certain until it happens. We are still some weeks away from wasps emerging from hibernation properly and all of us at Hampshire Wasp Control are still working on the moles. I have been mole catching in Tadley and Basingstoke this week.